Three out of four ain’t bad but the crucial loss was in the Seniors, who went down by 4 points to the ladder leaders Palm Beach-Currumbin. It was a match the Pies could have won but they after a good early lead before PBC took control, however with PBC reduced to 18 men for the final quarter the Pies had a chance to pinch it and fell short by a single kick. Form this year suggests any of the top 6 are good enough, but you have to get there first and be part of the top 5! The run home of the top six clubs is listed below. The Pies are the only club not to have a bye so have an opportunity to claw back 4 points on the other clubs and then it comes down to just winning games of footy. The final amtch of the year vs Surfers could be for a double chance, or it could be for 5th spot. Only time will tell! Broadbeach-- 36 pts-- PBC (a), Sandgate (h), Grange (a), bye, Labrador (h). The match against PBC was held up for 30 minutes in the third quarter when a young Lion player suffered a severe concussion in a collision. The medical staff of both clubs were fantastic in the management of the player as his injuries were such that they decided to wait for an ambulance. The player was transported to PAH and was allowed to leave then next day after being admitted for observation overnight and cleared of any spinal injuries. Jake De Winter is still second on the QAFL goalkicking ladder with 36 goals, trailing leader Broadbeach’s Matt Fowler on 39 goals. Ryan Harwood leads the Pies Syd Guildford best player voting with 31 votes in eighth place behind leader Campbell Wearne of Morningside on 51 votes. Voting goes silent for the last 5 rounds and with 10 votes per game on offer, Harwood is not out of the running. On Saturday Harwood polled 6 votes with Tom Ielasi 4, and Jake De Winter 1. The Reserves held on after a good first half but faltered in the third quarter before regaining their composure to claim a vital victory. The Pies Reserves have faltered several ties after half time this year and the question has to be asked what coach Des Lashman says at half time!! They are still a chance for finals but cannot afford any slip-ups, certainly once they get there - nobody will want to play them! The Colts disposed of fellow finals contender PBC in emphatic fashion with Finn Collison leading the way with 7 goals. The second placed Colts have another challenge on Saturday against third placed Wilston Grange, but have an embarassment of riches at their disposal talent wise, we don't envy the Colts match committee! The 2008 reunion was a great success with 19 of a possible 22 players attending. The reunion was organised by 2008 premiership captain and current Woodsmen coach Chris Mihalopoulos , 2008 premiership coach Paul Grentell, and Tim McEvoy, who was a member of the leadership group in 2008. Standing: Quentin Johnson (Assist coach), Sean Mewing, Chris Judson, Val Pope, Matt Thompson, Todd Dunn, Jim Rozynski, Gerard Moore, Luke Scott, David Hamill, Jack Burford, Matt Vowles (2008 President) Greg Friis, Simon Mapplebeck (2008 committee), Ian Carroll, Tim McEvoy, Mark Dowley (vc). Of the 2008 team, those currently playing include Sean Mewing, Gerard Moore, Chris Judson, Val Pope, Tim McEvoy (occasionally), Ben Jaenke-Cain and Chris Mihalopoulos at the Magpies, Matt Fowler is at Broadbeach, Greg Friis is at Springwood, Jim Rozynski and Luke Scott travel down to Mitiamo near Bendigo in Victoria and Matt Thompson is at Ainslie in the ACT. 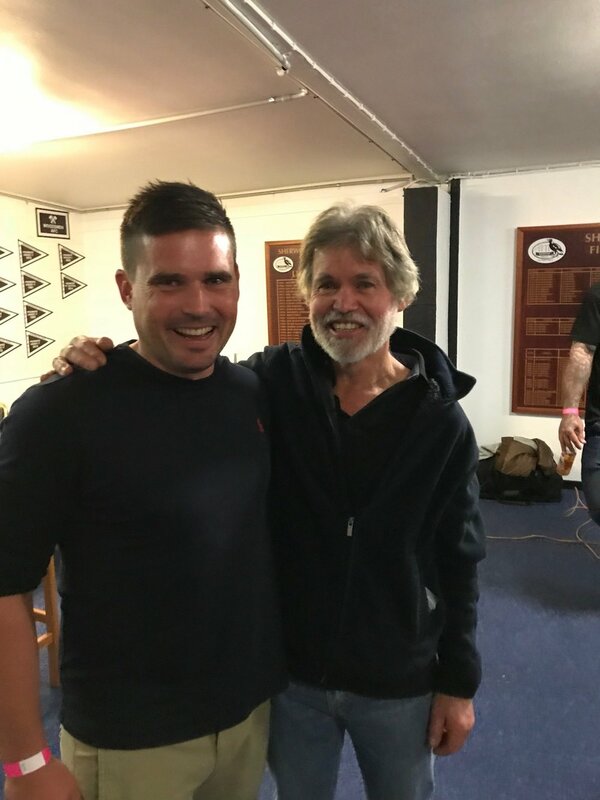 Paul Grentell spoke about the 2008 premiership and in a lighter moment said there we three things he did not think he would ever see-- Mika owning his own Real Estate business, Val pope playing Reserves and Mick Ford joining the Victoria Police. It was good to see Mick make the journey as he was the ultimate team man and he recently coached Tyrendarra near Warrnambool to a flag and is famous in country Victoria for one of the great three-quarter time sprays ever—check YouTube for a look!! Paul Grentell spoke of the 2008 flag and that his players were prepared to do the small things to achieve victory. They trained 3 times per week and made sure they did all the small things to be prepared. PBC that year had x2 ex-WAFL and x3 ex-SANFL recruited players in their team but Paul had faith in his side. He believed his team were fitter and faster and would wear the Lions down the longer the game went. The huddles at the breaks were huge and he said you could feel the energy from the magpie army. With Ian Carroll in ruck with a broken cheek, Sean Mewing a broken eye socket, Todd Dunn a broken nose and Tim McEvoy shoulder busted up again, he asked for a big effort and he got it as the Pies triumphed in a classic. And how could the Pies lose? --Ian "Easy" Carroll consulted a fortune teller in the week leading up to the match and was told the Pies would win!! Club President in 2008, Matt Vowles recalled how the PBC president, apparently not the friendliest bloke, would give him a hard time at league meetings, suggesting the Pies should not even be in the competition and would be easy fodder for the Lions. Matt said when the siren sounded it was the sweetest of sweet victories!! Warren Selvage played in 9 Sherwood premierships and spoke about the 1978 flag. He praised captain-coach Lindsay Jacob who was a born leader and as tough as they come. The Pies were a young team but were fit and stuck together off the field. In one of the matches during the season against Mt Gravatt, the scores were disputed and the Mt Gravatt goal umpire had the Vultures winning by a point and the Sherwood goal umpire had the Pies up by a point. It was proposed the match be replayed during the week and the Pies were unanimous they would play Mt Gravatt anywhere at anytime. Mt Gravatt declined the offer and the match was awarded to Sherwood. Only Des Lashman, Warren Selvage, Paul Hope, Bill Peirce and John Judson attended from the 1978 flag. Maybe the reliance on Facebook to get the message out may not reach some of the older brigade who need more old fashioned contact methods like a phone call, letter or newspaper article to be notified of events. Or perhaps having won 9 Premierships together, the reunions are too often?! Father and son John and Chris Judson celebrated their respective premierships and if not mistaken may be the only father -son premiership duo at the Magpies. Chris & John Judson - both Magpie Premiership players multiple times. The Woodsmen enjoyed a solid win against tough opponents in Jimboomba on Friday night. Having lost their opening 3 games, the Redbacks were on a 9 match winning streak and looking to make it 10 before top placed Woodsmen knocked them off. Irishman Sam Banim playing for the Woodsmen has kicked at least 5 goal of the year contenders this year and just knows where the big sticks are, he can do it all at ground level with dribbles, checksides, snaps and everything in between. His latest effort wasn't even a surprise to his teammates as he casually slotted a checkside from the boundary line much to the disbelief of the opposition and crowd. Due to his work as a paramedic, Banim can't commit fully to footy, but if he did - he'd be moving up the ranks pretty quickly! With 3 rounds to go, the Woodsmen look unassailable at the top of the QFA Ladder, so start making plans for a big home final in a months time, would be great to get the Magpie army behind the boys!